Chicken Wonton Soup is perhaps one of the most ordered soups at a Chinese restaurant. Soft bite-size dumplings called Wontons, are stuffed with meat or vegetables, and cooked in a clear broth infused with aromatics like ginger, garlic and spring onions. I love this soup, and have figured out an easier way to make it on a weeknight too, using store-bought frozen chicken wontons. This hearty and healthy recipe for a real easy Instant Pot Chicken Wonton Soup makes for one delicious and satisfying dinner. 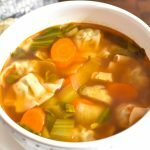 For all my vegetarian readers, I have also included an easy customization to make Vegetable Wonton Soup in your Instant Pot. 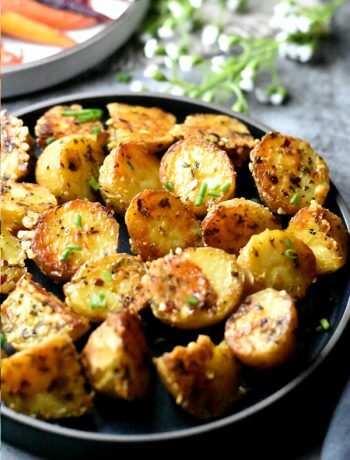 I love simple and easy meals like this, that are so comforting at the end of a long day. When I have time, I love to make homemade wontons for this soup using ground chicken, spring onions, aromatics and seasoning. But, for weeknights and crazy times, this soup is real easy to put together using my favorite store-bought frozen wontons, Chicken Cilantro Mini Wontons from Trader Joe’s. This soup will work equally well with your favorite brand of dumplings too. All you have to do is add all ingredients, except wontons and greens, in the Instant Pot, pressure cook for 2 minutes, release pressure, add wontons and greens, and cook for another 2-3 minutes. Done! 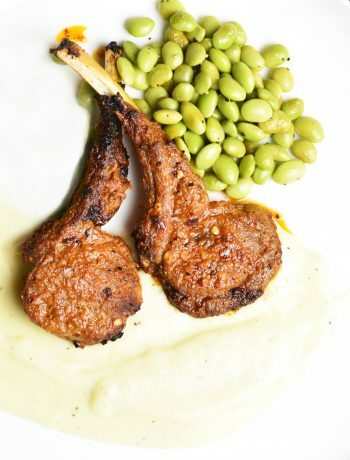 And dinner is served in under 30 minutes. It is extremely easy to make this soup vegetarian by switching just two ingredients. Switch the chicken broth with vegetable broth and buy your favorite flavor of vegetable dumplings. 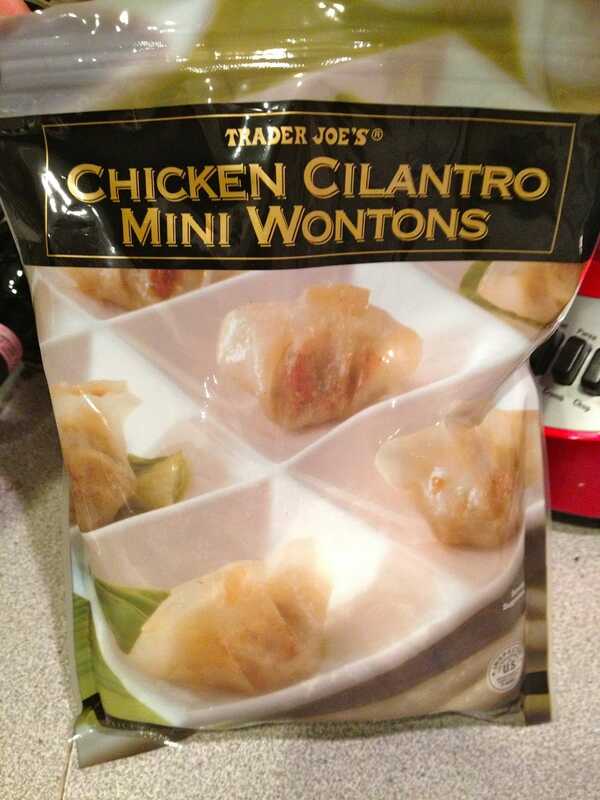 I personally like the Thai Vegetable Gyoza dumplings from Trader Joe’s. I combine that with their low-sodium vegetable broth. Heat a large stockpot on medium-high heat. Add all ingredients EXCEPT wontons and greens. Bring everything to a boil, reduce heat to medium and simmer for about 6-8 mins. Open lid. Add wontons and cook till they float on top, takes about 2-4 minutes. Turn off the heat. Add greens and stir well. Let them soften in the soup for a few minutes. Serve warm! 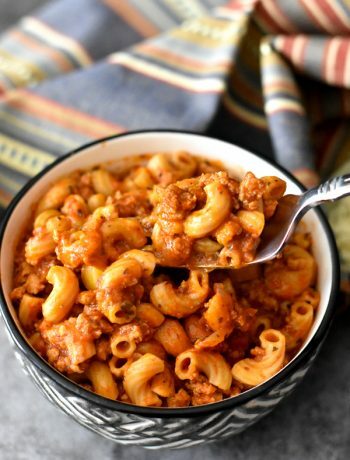 Check out more INSTANT POT SOUP RECIPES here! This Chicken Wonton Soup is nutritious & filled with healthy vegetables. 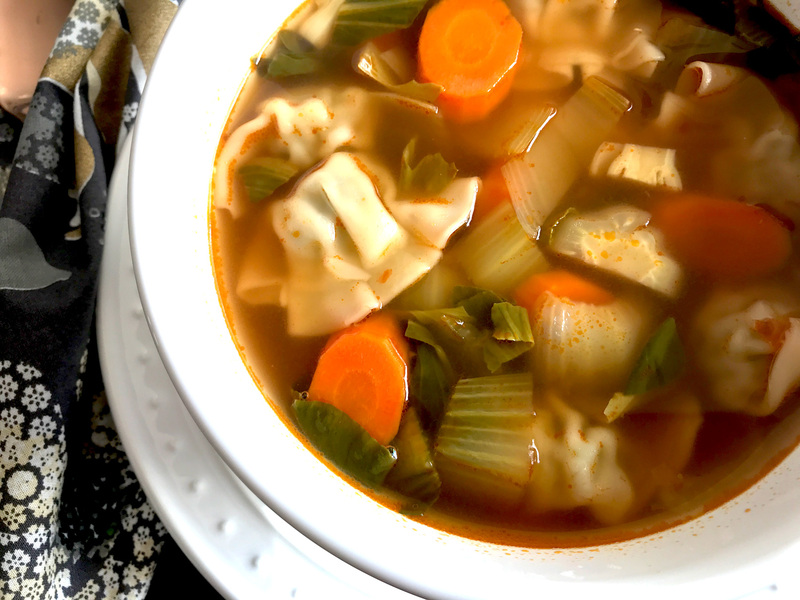 Just cook broth, veges, & aromatics together in the instant pot & then add wontons. Easy to make vegetarian by using vegetable stock & vegetarian wontons. Prep the veggies: For bok choy, chop the leaves and keep aside, they will be added after cooking is done. Chop the carrots and boy choy stems. Finely chop ginger and garlic. Turn on Instant Pot: Add chicken stock and everything EXCEPT wontons and boy choy ‘greens (leaves)’. Close lid. Pressure cook for 2 minutes. Manually release the pressure by moving the pressure valve from Sealing to Venting mode. If you are multiplying this recipe, wait 5 minutes before releasing pressure to avoid the soup from shooting through the pressure valve. Open lid once the pin drops. Finish: Turn on SAUTE and add the frozen wontons. Cook 2-4 minutes till they float on top. (Watch the video). Cancel SAUTE and add the boy choy greens that you had kept aside. Stir and let them soften in the soup for a few minutes. Prep the veggies as above. Heat a large stockpot on medium-high heat. Add all ingredients EXCEPT wontons and greens. Bring everything to a boil, reduce heat to medium and simmer for about 6-8 mins. Open lid. Estimated Time: Prep: 10 mins, Pressure build-up: 10 mins +/-, Pressure Cook: 2 mins, QR, Saute: 2-3mins, Total Time: 25-26mins.